In light of the news that Ubisoft is shutting down servers at the end of the month, I was wondering if anyone had GRAW 2 and was willing to work on the online stuff. I'm not really sure how tough / easy it's going to be but from my initial browsing of the solutions, seems like you need at least 5 people. If you are interested, drop me a message or respond here. Would like to get working on this as soon as possible. 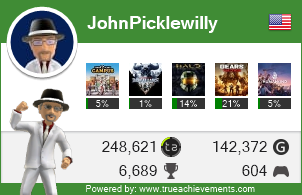 I have that game and need 7 of the multiplayer achievements. I'm in! Edit: Can we make this one of the games we boost on Monday or Friday (or Tuesday if we're still doing Tuesdays)? I think that is an excellent idea... I'll more than likely put up a session for next Friday night and we'll see if we can get like 5 people. Do me a favor and review the MP achievements to make sure we've got enough people. I'll double check as well. The game can be played with linked Xbox's and/or can be played split screen for up to four players. So, if you have friends locally that have the game, you can still get the achievements after the servers are shut down. I assume that co-op achievements will be will be affected as well as the multiplayer achievements. There are several multiplayer achievements that can be completed with only two players. Many of the co-op achievements can be technically unlocked with only two players. But the co-op missions in that game require a group of players to complete successfully. I will add the multiplayer and co-op achievements for this game to the boosting spreadsheet and include the number of players required. We were in a couple of sessions and I believe I completed all I needed to with the exception of the single player stuff. I believe JPW completed the game but I could be mistaken. @kbeau73 wrote: We were in a couple of sessions and I believe I completed all I needed to with the exception of the single player stuff. I believe JPW completed the game but I could be mistaken. I did indeed complete the game. However, I'll be happy to help anyone who wants to work on it, providing the servers cooperate. I was able to create a lobby, could not find one. But it's looking like servers are still functioning. I could be wrong but I believe the achievements that were discontinued were for the online co-op ones but maybe they never followed through with the shutdown. Although after looking at one of the Co-Op mission achievements.. it says someone won it back in June of this year... maybe it's still possible. Some of the missions were pretty tough and required a bigger group. 3 of us probably wouldn't cut it. I have the game and am willing to help out.